Written and photographs by Hubert Hung. 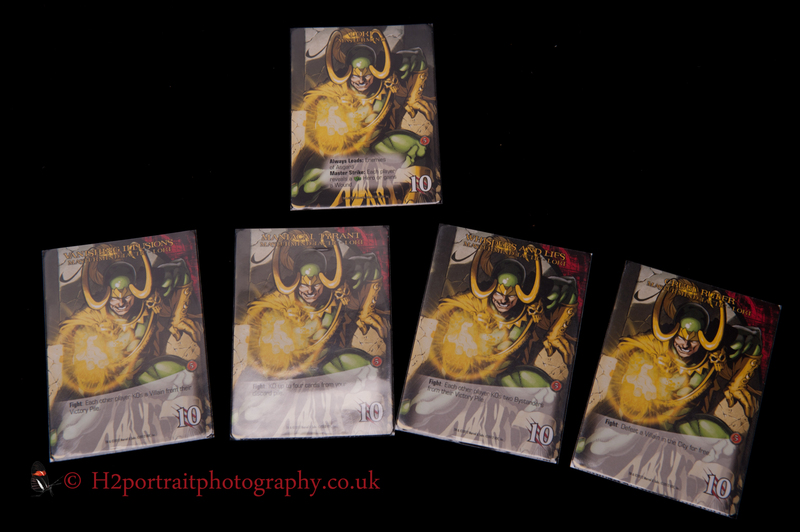 Marvel Legendary. Designed by Devin Low, published by Upper Deck, 2012. 1-5 players. Jared and I have been playing board games together for quite some time, but I always played his ones as I never had any of my own. Then he sent me a link to Marvel Legendary being play by Wil Wheaton and a few friends on YouTube. I really liked the look of it and I was a huge comic book fan at one point in time. I decided I was going to buy a copy and thus started my modern board game collection. 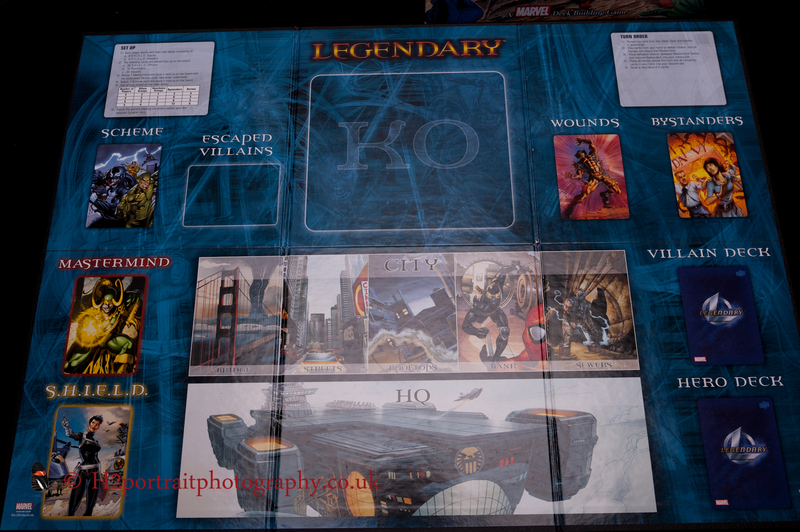 So, what is Marvel Legendary? The Loki “Mastermind”. The top card is placed on top. Each time you defeat him, draw one of the four cards (at random) below and resolve their effects. 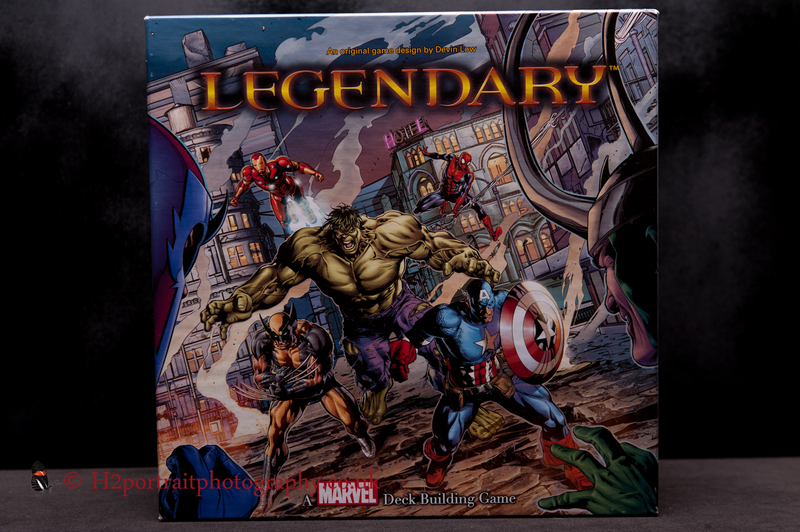 Marvel Legendary is a cooperative game (players work together to defeat a common enemy) that plays like a comic book adventure. There is a lead bad guy (the mastermind) who comes up with a dastardly plan (scheme card) from robbing a bank to ending the universe. The mastermind recruits a group of their friends (villains and henchmen) to help them. In response to this, SHIELD deploys its agents and troopers to stop them. They recruit heroes to help them fight the baddies. The game is won if SHIELD is able to take down the mastermind four times and villains win if either the conditions of the scheme are met or the villain or hero deck is depleted. Each player is in control of a team of SHIELD operatives and heroes. A selection of the cards from the base game. This game is a deck-builder. This means each player starts off with the same set of starting cards (all pretty weak). They draw (in this game six) cards to form a hand and play them on their turn. Some cards allow you to recruit heroes from the HQ others to attack villains as they appear in the city or the mastermind, eventually. When you recruit a hero they are placed in the player’s discard pile. At the end of your turn all the cards from your hand are placed there. When your draw deck has been exhausted, you shuffle the discard pile to form a new one. Repeat and rinse until you win or loose. The aim is to improve your deck over the course of the game. Some of the cards synergise with each others creating powerful combos. Deliberately obtaining cards that will do this will help you win the game. Each turn, a card from the villain deck is turned over and the card is resolved. Most of the time it is a villain. They can be attacked and, if defeated, added to your victory pile. Some of them have effects as soon as they appear, if they escape the city or if your fight them. If a scheme twist card is turned over, they activate an effect on the scheme card if a master strike card is turned over, the mastermind attacks. In most case these are bad for the heroes. If you do win there is the option to add-up the number of victory points on the villain and mastermind cards. The player with the highest score wins overall. The main board. It has a setup and turn sequence box in the corners. These are useful when you first start. The game comes with a sturdy fold out board, that takes up quite a bit of space on the table, with areas to place stacks of cards. The cards themselves are made from a quality cardboard. The artwork is original, decent and bright. There are four different versions of a hero. Two common sets (five in each set), one uncommon set (three in each set) and a single very powerful rare. The only complaints are the heroes in the base set all have the artwork and I am not sure why art from the comic books were not used. They are in other games like Dice Masters. A licensing issue? In subsequent expansions each set has different art. The base game comes with dividers for the cards. You will run out of these if you buy expansions. The rulebook is very clear and well laid out. The box is large, sturdy and has room for expansions/sleeved cards. The inlay has plenty of room to house the cards and that it is component wise. 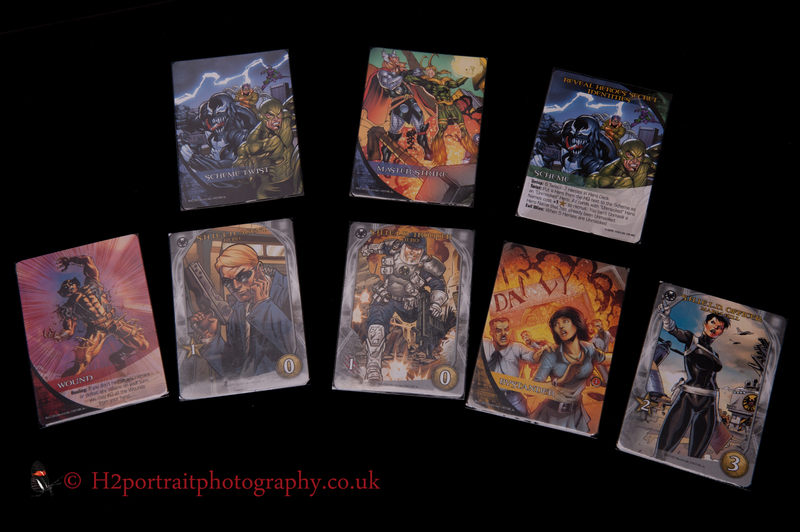 Some of the henchmen and villains from the base set. HAIL HYDRA! The comic book theme of this game comes over well. As mentioned in ‘the game’ section the game plays like an adventure straight off the book shelf. You do feel like a field commander deploying their troops against a foe and their minions. In true comic book fashion, there are twists and turns just to throw a spanner in the works when you think you are doing well. My only criticisms, are I would rather be playing as one of the heroes working along side others to win the day. For a co-operative game, you cannot help the other player by powering them up, giving them cards or even helping to pull-off a special move that deals the decisive blow. There are co-operative games of this type that do have this feel. The main mechanism is deck-building and that is pretty much it. You play your cards, acquire new ones and everything goes into your discard pile. There are key words that appear in some expansions that enable you do something special. For example, wall crawl means that when you first acquire a card it does not go into your discard pile like all the others, it is placed on top of your draw deck so it can be played next turn. Another one is focus, this enables you to convert purchasing power into attack strength. This comes in handy once you have beefed up your deck and you no longer wish to keep adding more cards to it because it becomes watered down. In some deck-building games you want to cycle through your deck very quickly especially if you have a number of powerful cards. This is another gripe, to create an efficient deck, you need to remove the original weak starting cards. Some villian cards will do this, but the game does not have a ongoing mechanism that kulls the starting cards. I find this annoying. Another option would be to have a mechanism to make them more powerful as the game proceeds. Being able to pull of combos with your cards is a mechanism that is also built into the game. Sometimes combos are triggered because heroes from the same team, have certain attribute or key words. Pulling these combos off is my favourite aspect of this game. Apart from that, there is nothing mind blowing about mechanisms in this game. 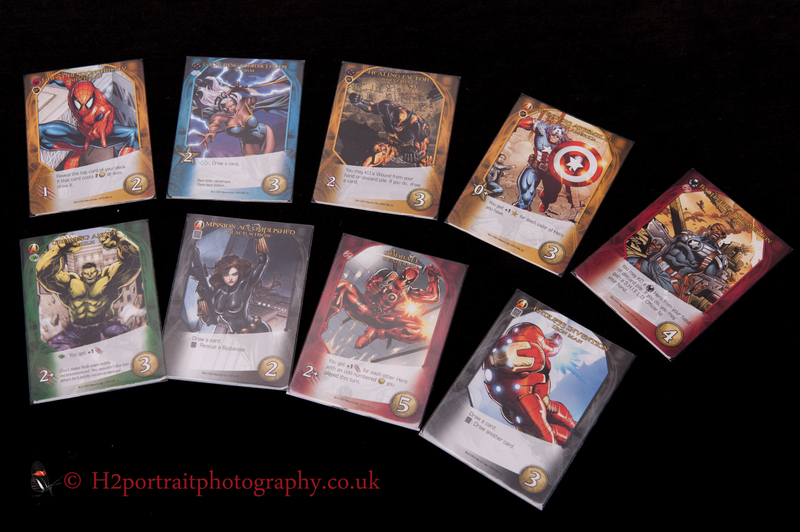 A selection of the heroes from the base game. All the different versions have the same art work, but (in some cases) have different coloured borders. This is where this game shines and its Achilles’ heal. 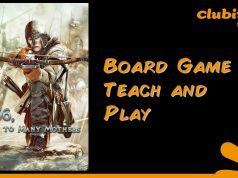 The base game comes with four masterminds of differing difficulty and a number of schemes. Just those permutations will keep you entertained, but on top of that there are numerous heroes to take them on. 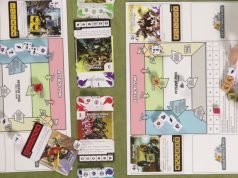 Each game you are faced with the task of working out which heroes would be best suited to taking down a mastermind and/or defeating a scheme. Choosing the wrong line up will result in a rapid defeat, but the right one will mean you will triumph! Having too much choice can be a games weakness. When you have an expansion or two it can be hard to choose. Sometimes you just want to setup a game and just play it not agonise over endless choices for the first ten minutes. If you can press through the above, this game will keep you entertained for a long time. The publisher, Upper Deck, releases expansions on a regular basis. Even a small one of a hundred cards will open up a whole world of new possibilities. You do not have to buy them. Do your research before you do. Two of the large expansion boxes with over three hundred new cards in each. Small expansion boxes have a hundred in them. A frequent criticism of this game is it takes an age to setup and pack down. As previously mentioned, you choose the mastermind, villains, henchmen, scheme and heroes. 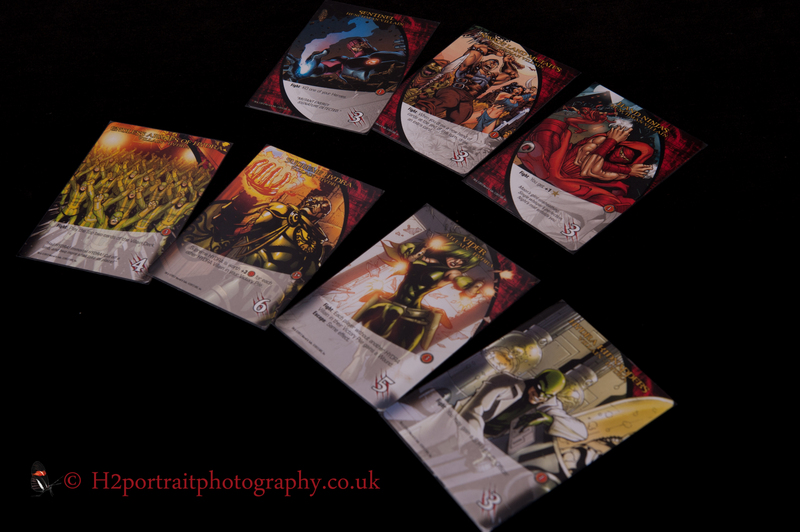 Then you have to create the villain and hero deck by shuffling the cards together. You want them to be randomised. This can take a lot of shuffling! Once the game is ready, it is a joy to play, unless you are being beaten on my the mastermind and their cohorts. There is a panel on the board that tells you the various steps during the turn. It does not take long to pick this up. There are times time when the combos become so convaluted that you loose track of how much attack or recruit you have, but this does not happen very often. Once the game is over, there comes the pack down. It takes a while to separate all the cards and put everything away. Not all deck-builders are this bad in this respect! The base game alone is great value for money. Although I do not take it out as much as I used to, my friends will often request this game if they are around my place. If you play a game on a frequent basis, it will pay for itself. As mentioned above, there are expansions, but you do not have to buy them and if you do, you can pick and choose. 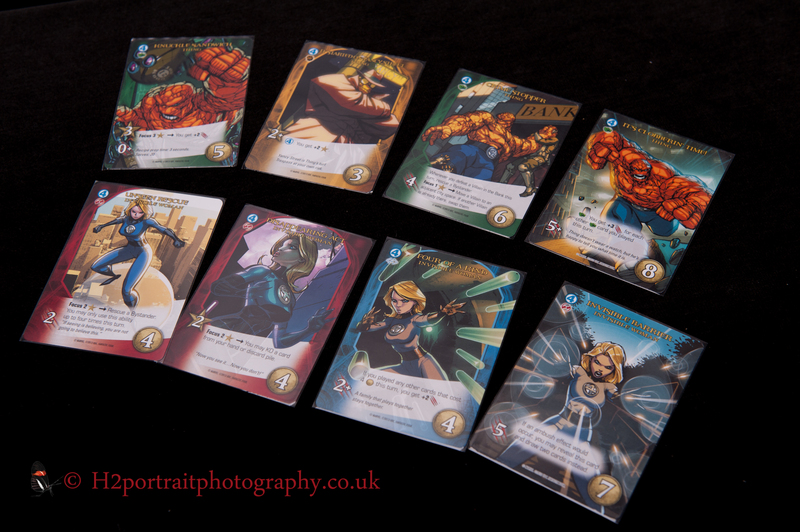 Once we are into it, I really love playing Marvel Legendary. No two games are the same and neither is it a foregone conclusion that you are going to win. In one game, we won on the very last turn because I was able to pull-off a combo to give us enough attack strength to take down the mastermind for the fourth time! I have lost my fair share of games too. Sometimes you need to tweak the heroes and play again. Some teams just do not work well together. This game has dropped down my list of favourite games of all time as there are others I prefer playing, but it still like this one. I doubt it will ever gather dust or be sold. I have invested quite a bit of money into it (three large and three small expansions) and I may buy more in time. If you like Marvel and want to play a game that gives you the feel of being in a comic book adventure, then check this game out! This review is dedicated to Stan Lee who passed away on 12th November 2018 (the day before this review was published). Without Stan, Jack Kirby and Steve Dikto, we would not have characters like Spider-man, The Mighty Thor (to name but two) and teams like the Fantastic Four. They changed the comic industry at the time and paved a new way forward. The legacy of Stan Lee will be felt as long as people continue to read comics and watch films based on them. Thank you, Stan for creating these characters that many of us know and love. 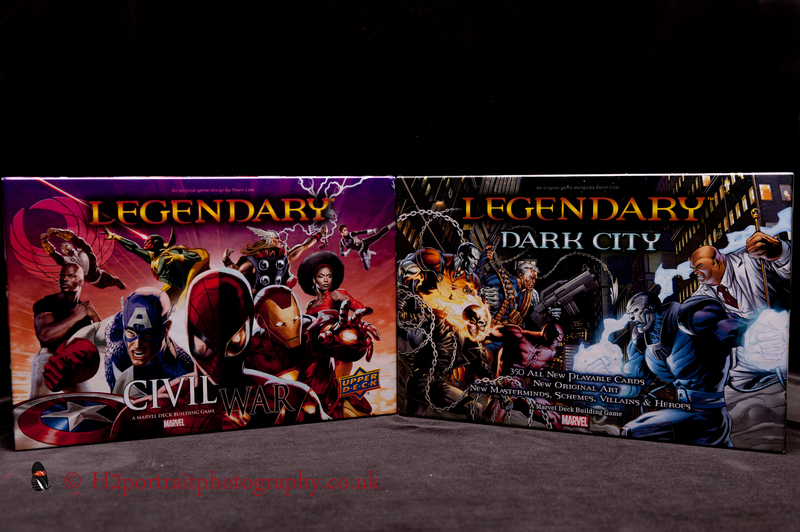 Without you there would be no Marvel Legendary board game and I may not have picked up board gaming as a hobby. Many thanks and excelsior! 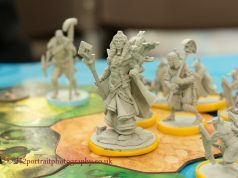 Previous articleTabletop magazine board game convention.